Reno, Nevada - Boxing aficionados know that a long lay-off from the ring more often than not, create “ring rust.” This phenomenon is usually characterized by lack of timing and decreased stamina. It usually takes two or three fights to get rid of the “rust” and bring one’s self to the former tip-top condition. If a fighter is not careful, “ring rust” can be one of the main reasons why a fighter returning from months of in-activity, may lose. Tonight at the Silver Legacy Resort and Casino in this city, “Filipino Bomber” Glenn Donaire demonstrated how to address the above-mentioned problem. In the process, he won a very bloody fight against a bull-rushing, head butting, and elbow using action-packed slugger named Jose Albuquerque. Albuquerque is a former Olympian from Altamira, Para, Barzil. Glenn Donaire, who lurks in the shadows of his more famous world champion brother, Nonito, Jr., has not fought since October 2006 when he was stopped in Las Vegas by Vic Darchinyan of Australia. Darchinyan last year, surrendered his IBF crown to Glenn’s brother, Nonito. Glenn Donaire was therefore on a very long 16 month lay-off. The inactivity is however not his fault. Until tonight, for some reason or another, his scheduled fights just kept on being cancelled. Fortunately for Donaire, he has a father who knows the sweet science very well and applies his knowledge to the advantage of his sons. Nonito Sr keeps his sons busy at the gym, with or without a fight schedule. Because of such work ethic, he is not too concerned about “ring rust”. He is also an excellent cut-man, a job he demonstrated extremely well tonight by managing the facial cuts of Donaire. Glenn’s inactivity on the ring resulted in the lost of his world ranking. His victory tonight is the first step towards re-gaining that ranking. Earlier this week, Donaire’s manager, Cameron Dunkin informed Team Donaire that should he win tonight, he will face Ulises Solis for the title next time around. 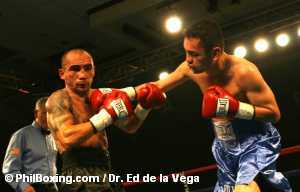 But, Solis for his part must beat Filipino Juanito Rubillar on April 18, 2008 when the fight at Dubai, UAE. Donaire has done his part. Now it’s up to Solis to do his. Otherwise, Team Donaire will target the other 108 lb title holders. Donaire and Albuquerque last met in March of 2006 at the Chumash Casino in Sta Ynes, California. Their 6-round fight ended in a draw although Donaire strongly feels he won that fight. His win tonight proved his point. He took all the dirty tricks thrown his way and he dished out his own. In the end, he got the nod of the 3 judges who scored 79-73, 77-75 and 77-75 giving Donaire a unanimous decision. After the fight, Donaire mentioned that he wanted to demonstrate something in this fight. He wanted to show that focus, discipline and hard work plus proper coaching can significantly negate “ring rust” and make a fighter win. Win…. is exactly what he did at the expense of the rugged Brazilian, Jose Albuquerque. Now Donaire is 17- 3-1 (9K0). Not too shabby for someone coming out of a 16-month hiatus. What is next for Glenn? Stay tuned. Cameron Dunkin is already working on it!